Coming into the 2018-19 season we are the #1 ranked basketball handicapper in profit earned over the last 5 years at the sports monitor! 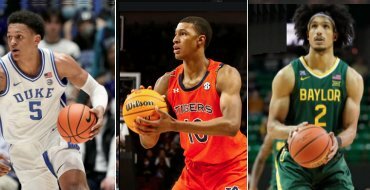 College basketball picks are another sport pick we offer at MadduxSports.com. Throughout the handicapping industry Maddux Sports is known as one of the sharpest ncaa basketball handicappers around. In fact in the last college hoops season contest that the UHC ran, Maddux Sports finished 1st in the NCAA Basketball Ultimate Handicapping challenge, this in addition to the first place finish we had in the NBA made Maddux the number 1 overall basketball handicapper in the country 4 years in a row. In fact in that NCAA handicapping contest the last 4 seasons we earned 44,710 units, meaning if you were to bet $100 per unit on our college basketball picks you would have netted $44,710! Last season we crushed all other handicapping services that had the guts to have their picks independently monitored as we finished #1 overall in profit earned for NBA and College Basketball picks combined. We also won the 2012-13 CBB Ultimate Handicapping Challenge (documented 69% winners in that contest) beating out all other online handicapping services for the 3rd year in a row! To be clear there was no one that had a better basketball season than Maddux Sports and if they tell you they did they are flat out lying!!! As most of you know Maddux Sports dominates in College sports. Our NCAA basketball picks year after year turn big profits for our clients that bet daily against the College basketball point spread. Below you can check our handicappers results from our College & NBA basketball season pick package. These figures are the average dollar amount earned per unit over the last 4 years for members. Even though last year was a great season, it is still important to see a larger sample size as results should be judged over the long term as the larger the sample size, the more conclusive a handicappers results are. Click here for more of an in depth breakdown as to what these numbers mean. As you can see our basketball season package is a wise investment for the College basketball picks subscriber. 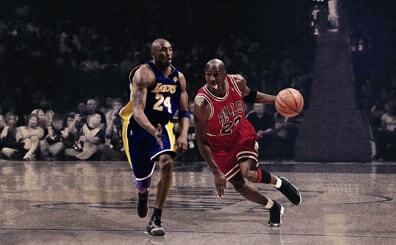 Remember that our winning NBA spread picks come free of charge. Before you make one more College basketball bet this season be sure to check us out and see what we have to offer. Below we have listed our premium basketball packages. Each package includes all NBA and College basketball picks for the term selected. 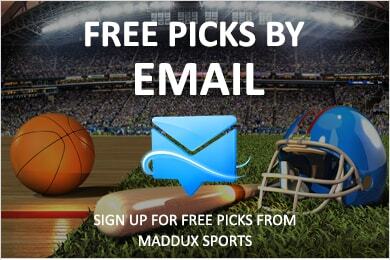 Just like all maddux sports packages they are all guaranteed to profit or equal time is given to you free of charge. All picks will be emailed within 10 minutes of purchase. MORE OF AN EXPLANATION OF THE PROFITS FROM ABOVE AS WELL AS OTHER FREQUENTLY ASKED QUESTIONS. For the NBA and college basketball we rate our picks 10 or 20 units. 98% of the basketball picks we release to clients are rated 10 unit plays, with the rare 20 unit pick every week or so. Over the last 4 years we have averaged about 396 units of profit earned per season, which would break down to 39.6 units of profit based on a 1 unit scale. Compare those numbers on a 1 unit scale to other NBA/College hoops handicappers and I guarantee you will find very few if any better than us. Using those numbers from above a $10 unit bettor averages about a $100 bet per game, a $50 unit bettor averages about a $500 bet per game, and a $100 unit bettor averages about a $1000 bet per game. Once again these are profits earned PER season, not overall and the numbers include the bookmakers juice. We average about 3 picks per day depending on how many games are scheduled and how much value we find on the board. Some days there will only be 1 pick, while others there could be as many as 5-7 basketball picks. How many predictions we release depends on a number of factors like how many games are scheduled for the day. Obviously a Saturday during the college hoops season with 90 lined games and a full slate of NBA is going to have a good amount of basketball picks. In college basketball all of our picks are against the spread picks. We dont release totals for a few reasons, the main one being the betting limits are too low to support all of our subscribers bets at the posted number. It only takes a $500 bet at one or two books to get a college basketball total to move 1 point or more at every sportsbook. There is much more liquidity in the college basketball point spread and it is still very beatable for an expert group of sports handicappers like Maddux Sports. The only other thing we can add is if you haven't enjoyed a winning basketball season on your own in seasons past, let Maddux Sports be your expert handicapper and start enjoying the profits from a winning sports picks bettor at your hands. Remember to consider this as a means of investment, and after betting our college basketball predictions all season long you will see the value of using our wagering advice. Even if you dont' choose Maddux Sports to be your basketball handicapper, don't fall for other websites offering 70% winners, inside information, and can't lose "locks". These are all things that scammers use to try and scam the uneducated public out of their hard earned dollar. Remember that if it sounds too good to be true, it probably is.